For anyone not familiar with the Stop Online Piracy (SOPA) act, a brief primer on it can be found on wikipedia. It is an act being considered by the United States Congress that would allow websites accused (not found guilty of, but accused) of engaging in piracy, promoting piracy, or simply creating an environment where piracy could theoretically take place from being blacklisted in DNS. For those not familiar with DNS, it is the ubiquitous service that takes a 12 number IP address and resolves it to a pretty URL like https://www.daedtech.com. Under SOPA, if someone accused daedtech of supporting piracy, typing the URL into your browser would stop working, searching for it on google would stop working, and pretty much everything about the site would stop working. Daedtech would be guilty until proven innocent. The bill is driven by intentions that are reasonable (but obsolete, as I’ll argue later) — to protect intellectual property. It’s aimed at stopping someone from bootlegging movies or music and setting up a website to share the plunder with legions of would-be pirates. But the approach that they’re taking is a bit like cutting off your leg to address a splinter in your pinky toe. I say this because “guilty until proven innocent” tends to result in paradigms more like the Salem Witch Trials and McCarthyism than it does in reasoned, judicious use of preventative force. In the current system, people are on their honor not to be criminals, which is how most of society works. With a “guilty until proven innocent” system, the system is on its honor not to abuse its power, which is how scenarios like that in 1984 get started. I submit that the only thing less trustworthy than John Q Public to be on his honor is The Prince being trusted on his honor. But, I digress. The end result is that the internet as a boundless repository for all manner of ideas, big and weird, all forms of collaboration, and all kinds of expression, from the disgusting to the divine, would be fundamentally altered, at least in the short term. It would cease to be a sometimes scary, under-policed realm and would, instead, become a “walled garden”. And the walls would be manned by corporations like the RIAA, MPAA, large software companies, and generally speaking, armies and armies of lawyers. Nevermind that none of these organizations save the software companies are particularly expert in the workings of the internet or technology – that isn’t the point. The point is to make sure that the internet is a place for free expression… so long as that expression doesn’t interfere with certain revenue streams. This is entirely rational (I sympathize with any entity protecting its own bottom line) on the part of the would-be police, but to call it a gutshot to the spirit of the internet would be an understatement. I’ll get to that in a moment, but first, let’s consider a term that most people have probably heard once or twice: Luddite. In most contexts, people use this to describe those afraid of and/or suspicious of new technology. So, it may describe a friend of yours that refuses to buy a cell phone and bemoans that people constantly use them. Or, it may describe a relative who has been writing letters all his life and isn’t about to stop now for some kind of “email fad”. But, the term Luddite arises from a very real historic scenario, with a subtlety different and richer message. In the late 1700’s and early 1800’s the French Revolution and ensuing Napoleonic Wars set the stage for rough economic times by virtue of Europe-wide destruction and devastation. Add to this an Industrial Revolution in full swing, replacing individual artisans with machines, and you had a perfect storm for unhappy laborers. A group of increasingly displaced, unskilled textile workers weren’t going to take their obsolescence lying down – they organized into a paramilitary group and executed a sustained, well organized temper tantrum in which they destroyed machines like looms and mills that were replacing and obviating their manual labor. This went on for a few years, and has the kind of ending that only a Bond villain could love. The British government smashed the movement, executed key participants, and progress marched on, as it inevitably does. This is indeed a story with no real hero. Instead of adapting or undertaking a campaign of ideas, a group of people attempted futilely to “stop the motor of the world”, and, in response, another group of people broke their spines. The theme of 2 potentially sympathetic interests acting in a way to render their plights completely unsympathetic via collateral damage is worth noting. Now for the most part, these concerns and others like them were “Luddite” in the common, vernacular, anti-technology sense, rather than in the scorched Earth sense of the actual Luddite movement. The cycle is predictable and repeatable – new thing comes out, current top dog is worried. Sometimes current top dog adjusts and adapts (radio), and some times he dies out (phonograph, cassette tape). But whatever happens to top dog, progress marches inexorably onward. In the list above, you’ll notice a constant over the last 30 years – the RIAA is afraid of and upset about everything that happens. Previously, the cycle involved some new medium replacing or gaining foothold beside an existing one. And, that continued through the entire list, but the only outlier is that the same entity is now afraid of everything that happens. Why is this…? I would argue that it’s because record labels themselves are anachronistic throwbacks that exist only because of previous power and influence. They are exclusively in the business of keeping themselves in business via influence peddling and manipulation, providing no relevant product or service. Let’s consider the history of music. For basically all of recorded history until very recently, musicians were exclusively performance artists, like jugglers or an acting troupe. They sold services, not consumable goods. Wandering minstrels, court composers, and random people with good voices played for whoever, royalty, and friends/family, respectively. Musicians occupied a place in society that ranged from plebian to whatever equivalent for “professional” or “middle class” existed at that place in history. This all changed when the invention of recorded music turned music into a commodity good rather than a service. At first, the change was subtle, but as music changed from something people had to make for themselves or their neighbors to a specialized good, a dramatic new paradigm emerged. Companies realized that they could leverage economies of scale to bring the same music into every living room in America or even the world, and they subsequently realized the star power that came with doing such a thing. Court Composers like Mozart had nothing on Elvis Presley. The upper crust had to go to see the famous Mozart perform, if they could get a ticket, but anyone with a dollar could enjoy The King (title very appropos here). Record labels went from selling vinyl discs with music on them to selling dreams, and musicians went from travelling charlatans, court employees, or volunteer music lovers to Kings (Elvis Presley) and Gods (Beatles being “more popular than Jesus”) overnight, in a historical context. With this paradigm shift, the makers of music had unprecedented power and influence via money and widespread message, and the facilitators of this, record labels, had control over that message and influence. It was the golden age of music as a commodity, where its participants were kings and kingmakers, and the audience served as their subjects. All of this was made possible by economies of scale. Not just anyone had the ability to record music and distribute it nationally or internationally. That required expensive equipment, connections, and marketing prowess. The kings were beholden to the kingmakers to anoint them and grant them stardom. The subjects were beholden to the kingmakers to bring them their kings, what with the everyman musician being a casualty to this form of specialized labor (meaning the days where someone in every family could play a mean piano were now obsolete since music could be purchased for a buck an album). But then a funny thing started to happen. The everyman musician started to make a comeback, not only for the love of the music, but also for the lottery-dream of being anointed as a king. Generations of children grew up listening to Elvis, The Beatles, Led Zeppelin, Michael Jackson, etc, and wanting the lifestyle of untold riches and adulation. Home music making equipment proliferated and improved and rendered the studio a luxury rather than a necessity. The internet exploded onto the scene and suddenly distribution channels were irrelevant. Sites like youtube and twitter emerged in “web 2.0” and now even marketing was available to the masses. Every service provided by the kingmakers when they were making kings was now available to the unswashed, plebian masses. Music is very much coming full circle, back to the point where heavily marketed, auto-tuned pop stars who play no instrument are unnecessary and the average person, with a computer, an instrument or his or her vocals, is perfectly capable of producing and sharing music. And, that situation is back with a vengeance since that person is now also capable of sharing that music with the world. Untold riches, record executives, destroyed hotel rooms and temper tantrums aren’t necessary – just an internet connection and an idea. The only thing that the kingmakers have left as this point is the accumulated money, power and influence from bygone glory days. They are obsolete. And, like anyone concerned about his own obsolescence, they have entered the camps of the Luddites. At first, it was the vernacular ludditism – whining vociferously about new technology dooming them, spreading FUD about the technology, etc. But now, to tie it all back to SOPA, they are taking the step of being actual, Scorched Earth Luddites. SOPA isn’t actually about stopping piracy. It’s about destroying the thing that has removed their authority to make kings – the thing that has revealed them as unnecessary, out of touch emperors wearing no clothes. SOPA isn’t about fairness – it’s about breaking into the metaphorical mill and taking a sledge hammer to the metaphorical loom. It’s about destroying the thing that is replacing them: the internet. The music industry is perhaps the most obvious example, but this applies other places as well, in that the internet’s very distributed, collaborative nature has created a cabal of outfits that wish the internet would go away. 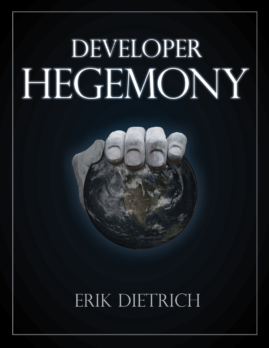 Book publishers (again, distribution economies of scale), older gaming companies, the movie industry, etc are all in relatively similar boats where instant, massive collaboration is replacing their purpose for existing. There is one key difference with today’s Luddites versus the original ones. The original ones were opposed by their government and eventually smashed by it. Today’s Luddites are using lobbyist influence in an attempt to purchase the government and use it to execute the destruction of the looms. Instead of oppositional forces, the government and the Luddites are threatening to team up to unleash destruction. But in the end, it doesn’t matter. Government or not, Luddites or not, progress marches onward inexorably. 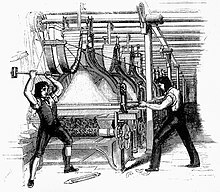 We as techies and most people as the consuming republic will gnash our teeth and (rightly so) do everything we can to prevent the destruction of the Luddites, but we may ultimately fail to stop them in a specific equipment smashing. But, what they can’t smash is the fact that the technology has been discovered and used and can be re-created, modified, adapted and perfected. At some point, their sledgehammers will dull, their resolve will weaken, and they’ll be relegated to the dustbin of history. This might be off topic, however Rep. Lamar Smith of Texas introduced the Stop Online Piracy Act to the US House of Reps. on October 26, 2011, calling for the expansion in the ability of US law enforcement and copyright holders to fight online trafficking of copyrighted intellectual property and counterfeit goods. Do you agree with SOPA, or should they kill the bill? Thoughts? Unequivocally, I think they should kill it as it exists. Generally speaking, I think that copyright and would-be copyright holders would be better served to innovate and create new means for securing a living than depending on an unenforceable and increasingly outdated set of government regulations to do it for them.